OKI Europe Launches New High Volume A3 Colour Smart MFP | Industry Analysts, Inc.
Egham 13th September, 2017 – Designed for the demanding corporate business world where print volumes are large, deadlines tight and expectations of quality output are exceptionally high, the ES94x6 MFP Series of copier-based A3 colour smart multifunction printers (MFPs) are the latest addition to the ever expanding OKI Europe portfolio. These stylish, high-powered MFPs with comprehensive paper input flexibility and full high capacity finishing capabilities are ideal for workgroups and departments producing reports, white papers and booklets as part of their day-to-day workflow. They are packed with up-to-the minute features such as a 9” tablet-style touch screen which includes, for example, swipe functionality, pinching in and out and drag and drop. Users can customise this screen, adding their own icons, including the company logo. 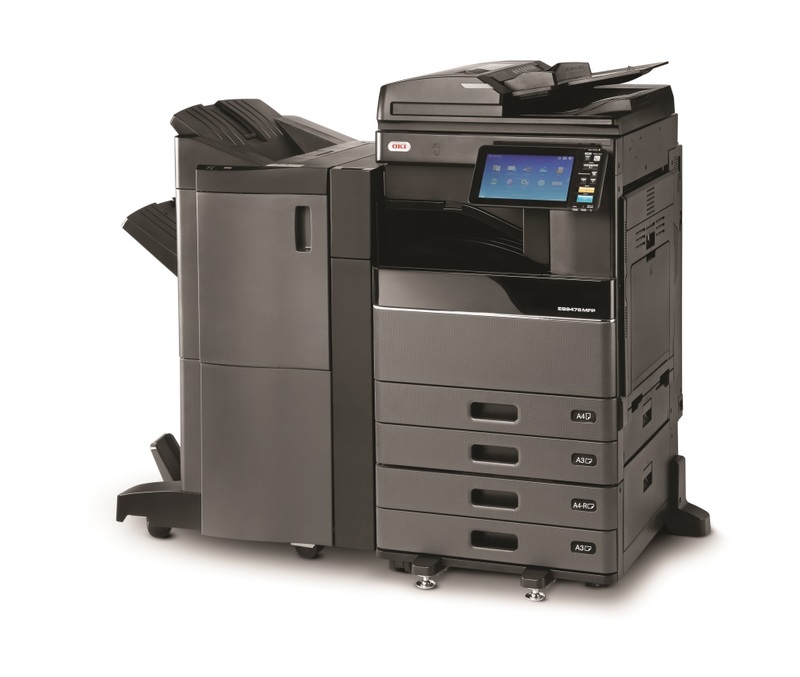 “With the launch of the ES94x6 MFP Series, OKI can truly say it has a device to meet the print workflow and document management needs of virtually every size and type of business, from personal A4 desktop printers to A3 departmental printers and MFPs. The ES94X6 MFP offers outstanding 1200×1200 dpi print quality and similar to our MC700/MB700 and MC800 Series, offers an impressive range of finishing options including inner finisher, inline multi staple and saddle stitch finishers.” says Polfai Ng, Product Marketing Manager, OKI Europe Ltd.
OKI’s new ES94x6 MFP comprises two models. The ES9466 MFP (35ppm) and the ES9476 MFP (50ppm) both stand out with super sleek black high gloss panels and are especially suited to high volume work with consumables designed to last longer to help reduce total cost of ownership. Despite their robust, heavy duty nature they have a smaller footprint than comparable MFPs and are super light-weight. Multiple ES94x6 MFPs can securely share information such as user data, role data and the address book with others on the network. They also feature a multi-station print function option enabling ‘pull printing’ without the need of a server. On the document management side, the option of an embedded OCR allows businesses to capture documents electronically so they can be managed digitally, and an embedded card reader makes the devices ideal for a managed print services approach. Embedded sXP (smart Extendable Platform) enhances productivity by allowing users to electronically capture, distribute and manage document workflows. 300-sheet Dual Scan Document Feeder (DSDF) model scans documents at 240 images per minute (ipm) (300 dpi) in colour and mono. 100-sheet Reversing Automatic Document Feeder (RADF) model scans documents at 73ipm (300 dpi) in colour and mono. Handles paper sizes from A6 to SRA3. Prints on stock from 60 to 280gsm. A4 printing and copying speeds: up to 50 pages per minute (ES9476 MFP). High capacity toner cartridge delivers 38.4k mono and 33.6k colour output. Finishing options include 2-tray Inner Finisher (IF), Multi-Stapling Finisher (MSF) and Saddle-Stitch Finisher (SSF). Advanced security features including a secure hard disk drive with a secure data overwrite option, secure networking with SNMPv3 and SSL-Encryption preserve the confidentiality of sensitive data. Eco features including sleep mode and reduced paper usage help reduce energy consumption, environmental impact and ongoing costs. This entry was posted in OKI and tagged oki by IA Staff. Bookmark the permalink.